So it is harvest and our local farmers' market is jam packed with delicious end of summer/early fall produce. Last Saturday I bought bushels of cauliflower, bell peppers, cilantro, tomatoes and a large bag of garlic perfect for storing in the pantry this winter. The weather people warned of chilly 34-degree nights this week so I harvested the remaining basil from my garden. What to make? Pasta with loads of vegetables and pesto of course. Happily, this is cauliflower week at Food Network's Fall Fest so the timing for this recipe could not be better. 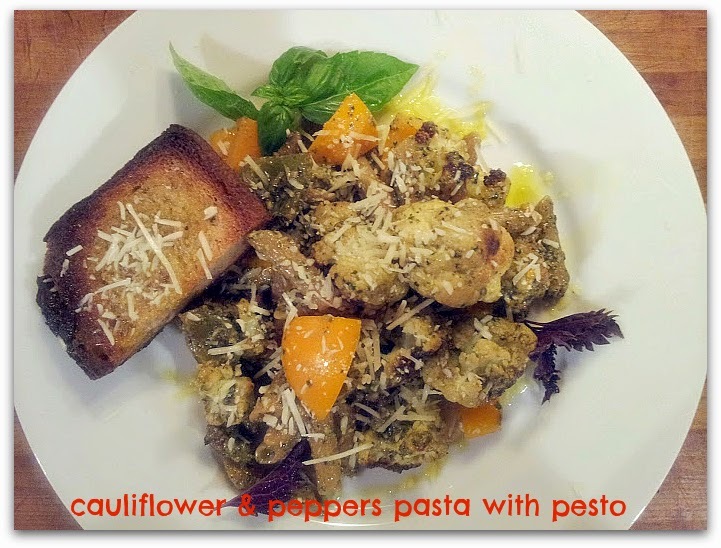 The vegetables are pan-charred for taste and texture and the spicy pesto is made with basil, (I used green and purple varieties today) cilantro, red pepper flakes, cheese and walnuts. Oh...and extra virgin olive oil. Use a big, bold, spicy oil for this dish. You will have leftover pesto which I think is a huge benefit. Cover the remaining pesto with olive oil and Saran wrap and keep in your fridge for a few days. Perfect as a spread on sandwiches, as a dip for fresh vegetables, dolloped on soup or just eat with crackers, cheese and bread for a wonderful lunch or appetizer plate. So very good! Add first 5 ingredients to the bowl of a food processor. Pulse until pureed. Add olive oil, a pinch each salt and pepper and 1/2 Tsp red pepper flakes to puree. Pulse until well mixed and very smooth. Taste and adjust seasonings if desired. Add remaining red pepper flakes if you want it a bit spicier. Scrape into small bowl and cover with a thin coating of olive oil. Set aside. Heat a large skillet until hot. Add the olive oil and the cauliflower and bell peppers. Allow to cook, without stirring, for 5-7 minutes or until charred in spots and heated through. Using tongs, turn vegetables and cook on the other side an additional 5 minutes until charred. (You want very deep brown color but do not let burn). Stir in onions and 1/2 Tsp each salt and pepper. Cook an additional 2 minutes. Turn off heat and set aside. Cook pasta according to package directions ensuring water is well salted. Drain, reserving 1/2 cup pasta water. Add pasta to skillet with cauliflower over medium heat. Stir in 1/2 cup pesto and 1/4 cup pasta water. Taste and adjust seasonings if desired. Add additional pesto and pasta water if pasta is too dry. Stir in tomato and serve with additional olive oil and cheese drizzled over top. Enjoy! roundup. Check out the other delicious sounding recipes from my blogger friends. 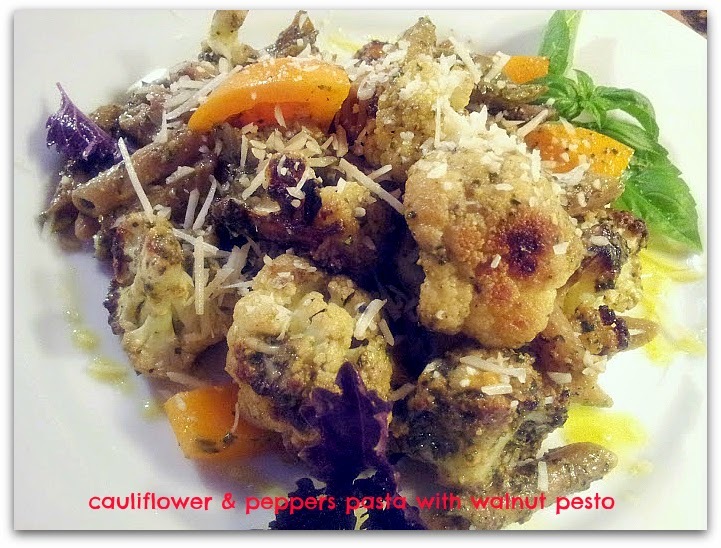 Do you have a favorite cauliflower recipe? Please share in the comments section and/or link to your blog if you have one.